This is my entry for the monthly Jihva For Ingredients, an event that celebrates all the wonderful natural ingredients that form the backbone of Indian cuisine. JFI is the brainchild of Indira from Mahanandi. This month, JFI is being hosted by Nandita of Saffron Trail. Nandita has chosen a spicy theme for this month: CHILLIES! Indian cuisine's love for chillies is legendary. Chillies lurk in every corner of my kitchen: the freezer contains "fresh" frozen green and red chillies, the refrigerator contains bell peppers, the pantry stores bottles of dried buttermilk-soaked chillies, and the spice box had a little cylinder of the hottest red chilli powder. Not to mention the fact that chillies have a place in so many of the spice mixes that I use everyday. However, for this month's JFI, I turned to another cuisine that loves and respects its chillies, and uses an astonishing variety of them: Mexican cuisine. A word about nomenclature: How do you spell this word "chilli" anyway? This has confused me for the longest time. From what I understand (and wiki seems to agree), the most acceptable spellings are Chile (in North America) and Chilli (in the rest of the world). Chili is not the preferred spelling because it more commonly refers to the stew of the same name. Chilly is not the right spelling (it means "cold"). And what about the whole chilli pepper business: is it chilli or is it pepper? Wiki goes on to say that botanically, all chillies and peppers are basically chillies, and that pepper properly refers to our black "peppercorn" pepper. But in common use, chillies are often called peppers or chilli peppers. Coming back to my Mexican-inspired recipe, here is why an enchilada is an appropriate entry for JFI:Chillies ...Enchilada comes from the verb enchilar (= "to add chilli pepper to") (according to Wiki)! In the simplest form, enchiladas are made by dipping tortillas (corn or flour rotis) into sauce, then rolling them up with some stuffing inside, and baking them with sauce and cheese on top. 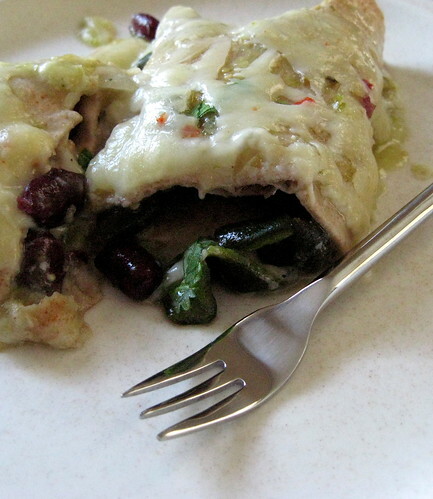 Enchiladas are messy to make, and messy to eat, and taste absolutely wonderful! The chilli that I used for the enchilada stuffing is the Poblano Chilli which gets its name from the Pueblo region of Mexico. 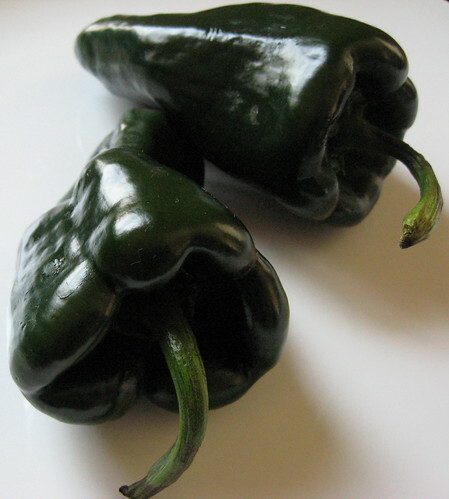 Poblano chillies are gorgeous- with their lovely shape (it resembles a tapered heart) and a sparkling deep green color. Their taste varies from sweet and mild to moderately spicy, and you would have to taste them to figure out the spice level of the ones you have bought. Poblanos are often stuffed and deep-fried to make a classic Mexican dish called Chiles Rellenos. Another traditional way is to pair them with potatoes and use them as a stuffing for tacos. 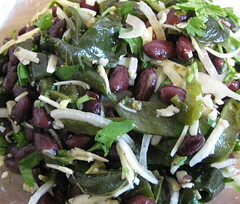 In my non-authentic-but-tasty-nonetheless recipe, I pair roasted Poblanos with kidney beans. Here is how I roasted them: (a) Drizzle chillies with 2-3 drops of olive oil each. Rub the oil all over. (b) Place chillies on a sprayed baking sheet and bake at 400 degrees F, turning once or twice, until the peel gets blistered. I used a toaster oven for this. (c) Remove chillies from the oven and place them in a covered bowl. When they cool down, the papery skin will peel right off. Cut away the core and slice the chillies. The salsa I am using today is a home-made salsa verde (green salsa) made with another Mexican ingredient: Tomatillos. These fruits resemble green tomatoes, however, they are more closely related to gooseberries (amla/ avla). Just like gooseberries, they are very tangy! The salsa is extremely easy to make (boil ingredients together, then puree) and contains no added fat at all. Tomatillos contain come pectin-like substance, and when you let the salsa cool down, it becomes a wonderful thick sauce. I use store-bought tortillas for enchiladas, have not tried to make my own just yet. I prefer using ones made with corn for enchiladas, but when I opened a pack of beautiful blue corn tortillas (from Whole Foods, bought on Sunday) to make this recipe, I found that it was moldy (!!!). So I ended up using whole-wheat flour tortillas this time. 1. In a saucepan, combine 1.5 cup water and all ingredients from tomatillos to salt. Bring to a boil, cover partially and simmer for 10 minutes. Let it cool a little. 2. Process this sauce in a blender/food processor/immersion blender to get it slightly smooth (you can leave it as chunky as you like). 3. Let it cool down. Mix in the fresh herbs and scallions. Taste and adjust salt if necessary. 1. In a small, mix together the ingredients for the stuffing. Be gentle with the salt, because cheese contains quite a bit of salt. 2. Pre-heat oven to 375 degrees F.
3. Take a square or rectangular baking dish and spread 1/3 cup of salsa all over the bottom of the dish. 4. Place the remaining salsa in a shallow container. Dip each tortilla into the salsa to coat it all over, then place some stuffing in it and roll it up like a cigar. Place it seam side down in the baking dish. 5. Once all the filled tortillas have been placed in the dish, pour the remaining salsa over the tortillas and sprinkle with the cheese. 6. Bake for 25 minutes or so, or until the cheese is all gooey and melty! For best results, serve piping hot enchilada with a chilled beer, or your favorite juice on ice. I'll see you on Sunday, with the Z of Indian Vegetables! Hi Nupur, those enchiladas look out of this world! hmmm looks awesome. that is one spicy entry Amigos. woow! u made the whole thing! nice entry... very apt for the chilies. This is a fabulous recipe Nupur...and Mexicans do share our love for chillies....I liked that spelling bit you've written and worried for a second if I'd got the spelling right (thankfully i have) LOL! Thanks for a superb entry. Goodness...look at that cheese! Nupur your Mexican dishes look as delectable as your Indian ones. Your enchiladas look great! I thinks I would like a nice glass of wine w/ them... any suggestions? That looks great and I love the salsa verde too. Awesome!!!! I like whole wheat tortillas to corn, somehow the corn smell puts me off..
Oh! BTW, as we approach 'Z'.. are u coming up with a new theme? Raaga, if you do want to make a version, it is possible to make excellent enchiladas with a red tomato sauce (indeed that is the most traditional). Tortillas can be easily made at home and you can stuff with any veggies/ bell peppers. Mallugirl, well, the tortillas were storebought :) But I do plan to try my hand at making them at home sometime soon. Priyanka, Mexican (I should say Mexican-inspired!!) is really easy to make for quick meals, and always a crowd-pleaser, and quite familar to the Indian palate with its bold and bright flavors. Dhana, the filling became a bit too hot with all those chillies, actually :) but the cheese toned it down and made it really delicious. Salsa is such a wonderful way to highlight the chillies - and the look of those enchiladas is making we wish I could have some...but I could make em too. Sounds great, can't see the pictures tho'! This is THE stuff! 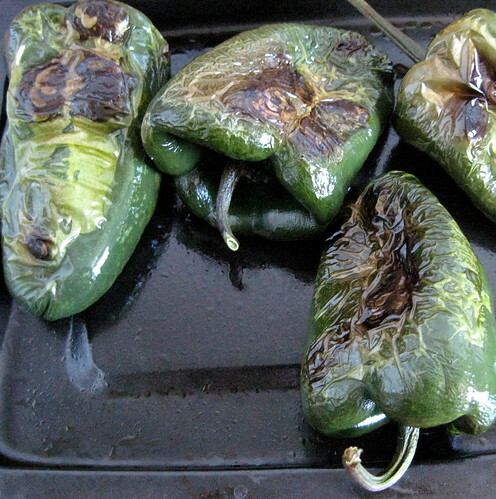 i love those roasting poblano peppers! 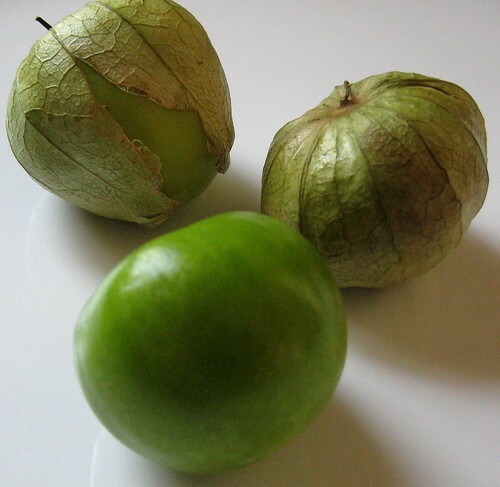 and aren't tomatillos great :-D. totally droolworthy food this is, Nupur.Ah! i have a serious craving now! 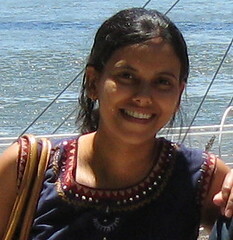 Nupur--Thanks for the great info on chillis [chiles?]. There are many Latino stores in my neighborhood, and I'm always fascinated by the wide array of chillis available. Thanks for some ideas for using them. Sorry we didn't get a chance to talk at the bloggers dinner in Chicago. I grew up in St. Louis and visit often--would have loved to compare notes. Everything looks so wonderful, but the salsa recipe, oh, that just tempts me. The market is this weekend, and I know just what I'll get. That looks really good. Restaurant Quality. i was sincerely hoping that someone posted something with poblanos for JFI. this dish looks perfect. Hi Nupur - Thanks for addressing that spelling issue! I've been scratching my head over that one for some time now. I didn't realize we were alone in using the spelling "chile"! 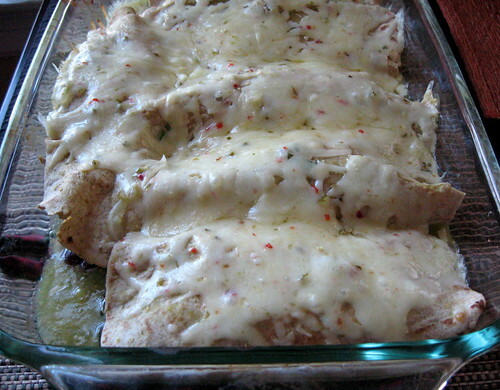 Your enchiladas look so good - I love the looks of that filling and can't wait to try the whole enchilada (pun intended!) My favorite Mexican inspired quickie dinner (or lunch) is a whole wheat flour tortilla warmed up in the microwave or toaser oven with a spoonful of beans (kidney, pinto, black, or even a more exotic variety - I recently tried "Mother Stoddard" from Rancho Gordo), some sauteed onions and bell pepper, some Trader Joe's corn salsa, a little cut up tomato, and a generous dose of hot sauce (Tabasco jalpeno). It's very messy, but yummy! Tee, enchiladas are so very easy to make at home. 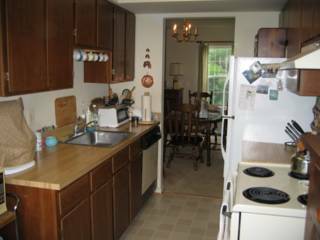 I think you will be pleasantly surprised! Archana, Anita gives some nice substitution ideas above. 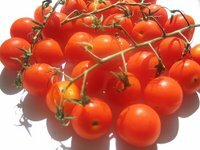 Look for recipes for red enchilada sauce on the 'net (it uses tomatoes). Sorry about the pic, I will try to reduce the file size of my pics. Jyotsna, really? Hmm...I can see them just fine. Musical, :D go make some quick! Terry B, I am so sorry we did not get a chance to meet too :( Maybe sometime when you make a trip to St. Louis?? Padma, poblano peppers vary in their hotness...these were very spicy indeed! They had a wonderful kick. Almost Veg., the salsa is sooo good. I was shocked that soemthing that was so easy to make could be so good. This was the first recipe I ever made using tomatillos, and we love it so much that I have never made anything else with them since! Roopa, go on, eat it up :) there is a fork there just for you! Suganya, I have wanted to make chile rellenos for so long, but deep frying large stuffed peppers....that is going to take some courage that I don't presently have :) We eat them sometimes in our neighborhood Mexican place. Cathy, I love your Mexican-inspired dinner! I often throw together stuff like that. The messier the better :) My favorite hot sauce: Fran'k's chili-lime hot sauce. But I have not found that in Missouri yrt :( The Mother Stoddard sounds intriguing! 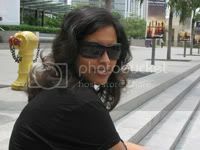 Sandeepa, I can imagine how busy you are! Take care, and hoping the little one gets better quickly. what a great dish! i am drooling at the dish! it looks so tempting. Enchiladas look fantastic ! love poblano peppers. I have tried your salsa verde recipe. It comes out really well. My husband loves it. yumm... it looks absolutely delicious, nupur, and i love enchiladas! Nupur, I've been trying a few of your recipes. I tried your bean enchilladas recently. They came out very well. My husband really liked it. Thanks for the wonderful recipe.